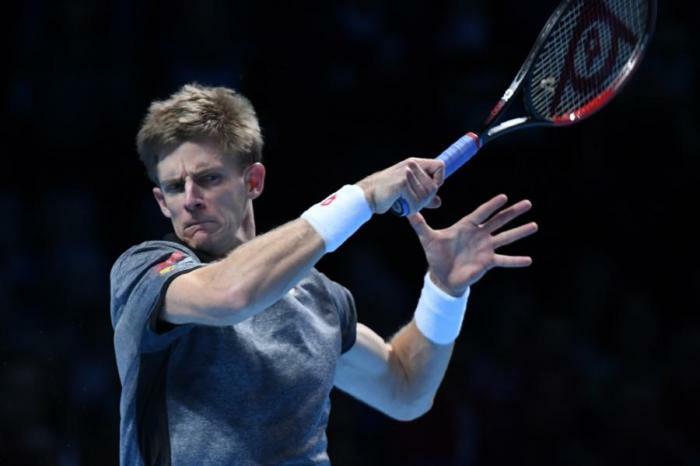 NOVEMBER 21, DELRAY BEACH, FL – Today, the Delray Beach Open (https://yellowtennisball.com/) announced that top 20 ATP World Tour Players Kevin Anderson, Milos Raonic and the Bryan Brothers have been added to the 2019 Delray Beach Open player field. They will join 2018 defending singles champion Frances Tiafoe and ATP tennis sensation Nick Kyrgios. In a blockbuster day of play on Tuesday, February 19, players scheduled to take the court at the Delray Beach Stadium and Tennis Center during the day session are Milos Raonic, not before 12:30 p.m. followed by Kevin Anderson, not before 2:30 p.m. Bringing the entertainment to prime time are returning singles champion Frances Tiafoe at 6:00 p.m. with Nick Kyrgios to follow, not before 8:00 p.m.
Fresh off his first appearance at the 2018 Nitto ATP Finals reaching the semifinals of the elite field of the world’s best eight players this year, local Palm Beach County (Gulfstream/Delray Beach) resident Kevin Anderson reached a career high singles ranking of #5 in 2018 and his second Grand Slam singles final at the Wimbledon Championships. Anderson, who has made seven previous appearances in Delray Beach, was the singles champion in 2012 and a finalist in 2014 and is in pursuit of his second title in Delray Beach. Joining Anderson is 2017 singles finalist Milos Raonic looking to capture his first singles title in Delray Beach. Raonic, who also had a stellar 2018 season, finished in the top 20 in the ATP Tour rankings and boasts eight career singles titles in addition to becoming the first Canadian player to reach a Grand Slam singles final at the 2016 Wimbledon Championships. Raonic has ended six straight seasons ranked in the top 25 reaching a career high of #3 in 2016. Making his first appearance in Delray Beach is Nick Kyrgios who trains in nearby Boca Raton. Kyrgios is known for his unique style, character and on-court flair for the dramatic boasting impressive wins over world #1 players Roger Federer, Rafael Nadal, Novak Djokovic and Andy Murray. Following the most successful week of his young career when he captured his first ATP World Tour singles title at the 2018 Delray Beach Open, Frances Tiafoe is aiming to defend his title amongst this year’s stellar roster. Tiafoe was the first wild card winner at Delray Beach and is the youngest American to win an ATP title since 19-year-old Andy Roddick won in Houston in 2002. He is also the first Next-Gen American to win a title and the eighth player to capture his first ATP title at Delray Beach. “Winning the 2018 Delray Beach Open was an amazing feeling and I am thrilled to be coming back in 2019 to defend my first ATP career title,” said Frances Tiafoe, 2018 Singles Champion. In the doubles action, Greatest Doubles Team of All-Time Bob and Mike Bryan – the Bryan Brothers – will take center court on Wednesday, February 20, in pursuit of their fifth Delray Beach Open title. Coming off an injury that left Bob Bryan sidelined in 2018, the Delray Beach Open will be one of his first events back on tour in 2019. The Bryan Brothers share over 115 career doubles titles together including 16 Grand Slam Doubles titles, the Nitto ATP Finals, all 9 ATP Masters 1000 events and gold at the London 2012 Olympics. 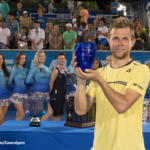 The 10-day 2019 Delray Beach Open will begin with an ATP Champions Tour team-event over President’s Day weekend (Friday, Feb. 15 – Sunday, Feb. 17), continue with the ATP World Tour singles and doubles draws starting on Monday, Feb. 18 and conclude with the ATP World Tour finals on Sunday, Feb. 24. Series packages and individual seats are now on sale. Individual tickets start at $38. Courtside Box Series are available in Standard, Premium and Platinum packages starting at $1,800 ($2,706 value), while the on-court Best Seats in the House and covered Stadium Veranda packages are up to 60 percent off regular prices, starting at $4,000 ($5,734 value). 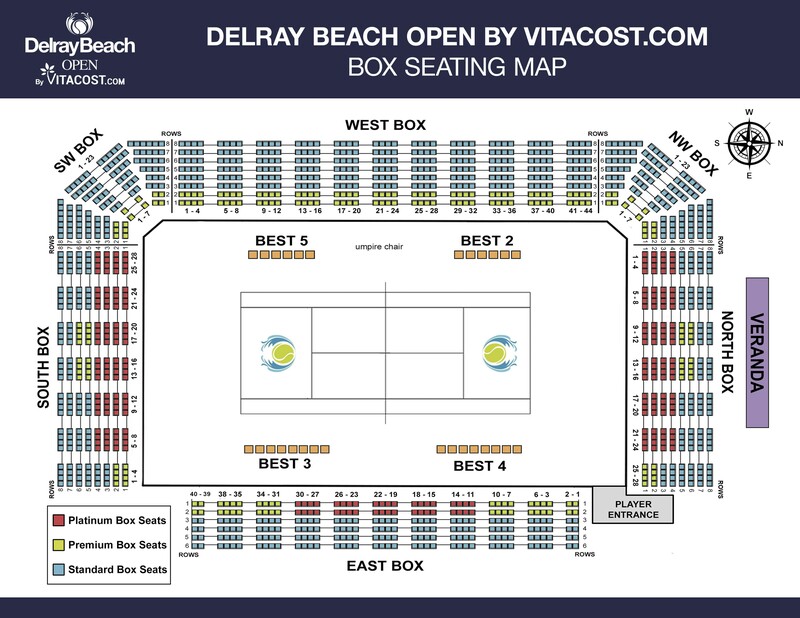 Series packages also include covered seating on Court 1, a new feature for the 2019 tournament. 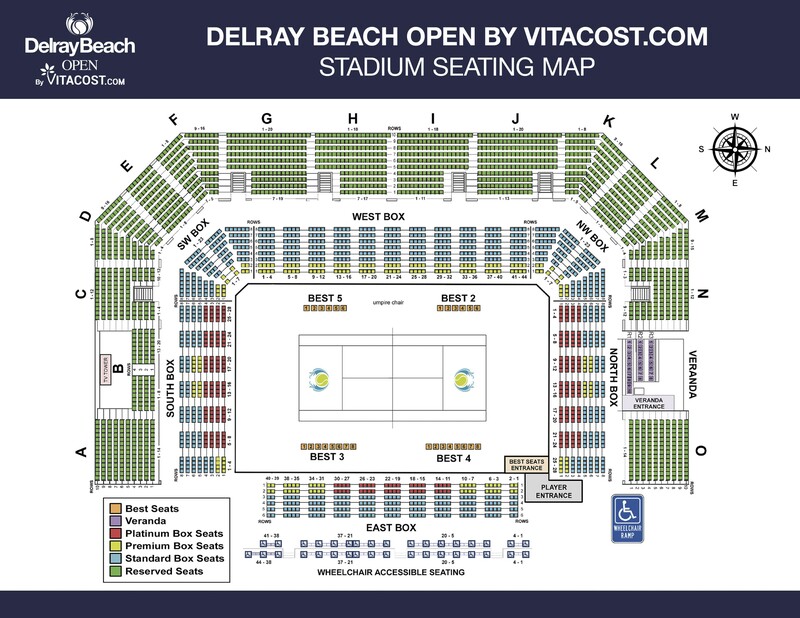 A complete schedule of all Delray Beach Open match times and ticket opportunities is posted at YellowTennisBall.com. Tickets can be secured online or by calling 561-330-6000.